Shopping for Transformers Remote and Radio Control Toys? In the explosive Transformers The Last Knight movie, heroes must rise in an epic struggle to forge a future for all. Autobot Sqweeks is the smallest of his fellow bots, but his spark shines just as bright. Despite being in disrepair, Autobot Sqweeks perseveres, perpetually motivated to help all living beings. Imagine jumping into Transformers: The Last Knight action with this Autobot Sqweeks RC figure. Autobot Sqweeks RC features motion and sound effects that will inspire fans to want to shout "Chihuahua," like the loveable Autobot Amigo. 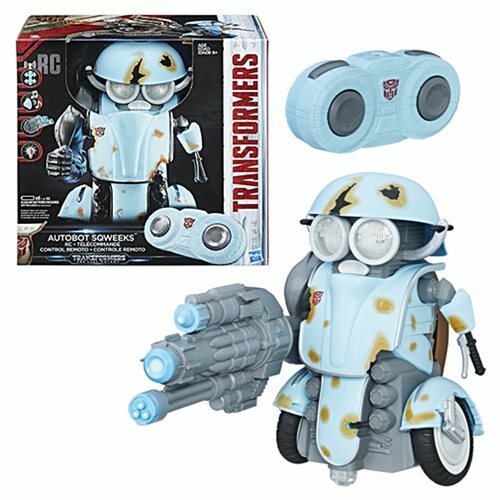 Prepare this Autobot Sqweeks RC figure for battle by switching him into blaster mode with a movie-inspired blaster accessory. Or activate an energetic boogie-down with music and phrases in dance mode. 8 1/2-inches tall. Ages 6 and up.